Of course we'll also have something to say about ITIL and OGC and itSMF and APMG. The whole certification debacle shows no sign of resolution - in fact APMG won The Coronation Street Pint For Longest Running Saga at the annual IT Skeptic Awards. COBIT and ISACA and ITGI will get attention too, especially as the two universes seem to be bumping together. If it turns out to be a matter/anti-matter thing then we could see some sparks. They certainly are different universes: like chalk and cheese, or like the Hitchhiker's Guide and the Encyclopaedia Galactica. The topic that interests me most right now is cloud computing. Look out for an article soon on how existing enterprise apps will never migrate to the cloud, and posts on how immature the whole thing is, how the vendors have already torn it to shreds by building proprietary solutions with zero standardisation, and how it is just another tech geek fantasy solution to a non-tech problem. Such technical solutions to non-technical problems often don't solve the original problem at all. They tend to introduce more problems of their own, and almost invariably introduce greater complexity to be managed, but IT loves them. They offer a silver bullet out-of-the-box fix to take the pain away, which is hard to resist. So it is with The Cloud. We don't learn. IT still runs after the latest silver bullet, or in this case the silver lining, heedless of the fact that a cloud represents a storm, poor visibility, dangerous lightning, and miserable conditions. Slowly IT is being drawn back into the business and taught to think like a business. One by one the tech managers are displaced by business managers. One by one the departments become accountable. One by one the cultures incrementally shift towards a focus on delivering service to the business and spending money as if it were their own. But it is obvious that we are still on a long road. We need to cut costs and increase scalability for sure. Spending many millions to float our existing business systems on a cloud isn't the right answer. Very few organisations see such wild variations in load that they need resort to the cloud for on-demand capacity. And the supposedly lower costs of management from service providers is a myth that the outsourcing industry still manages to perpetrate. When all the hidden costs - including lost IP, risk, migration, delays (ironically) and provider overheads - are factored in, the benefits are less compelling. Eric Knorr says “the ability to add capabilities quickly without capital investment is the real benefit of the cloud”. I disagree. Cloud capabilities are not exempt from the same considerations of robustness, reliability, accountability, compliance and audit as internal resources. Removing the capital component of the costs is not a significant saving overall. (Knorr has no illusions about cloud computing: “Fantasies of hyperautomated, self-organizing IT have been around for decades”). We should be concentrating on the non-technical aspects of IT, where there remains enormous potential for greater efficiencies in areas such as improved morale, better business skills, more efficient processes, reduced change failures, better project selection and management, server consolidation, open source, renegotiation of contracts for spare capacity onsite, and outsourcing of selected specialist functions in-house (such as network administration, monitoring, and provisioning). Cloud computing is another vendor-driven fad that adds complication, risk and expense. One day it may prove to be a useful tool in certain contexts, but it isn't the miracle fix it is touted to be. We won't save money by building ever more complex tech toys. The IT SwamiLate last night as I worked at my computer, I looked up at a sound in the normally quiet cul de sac that houses Two Hills World Headquarters Tower. From the back door of a police car tumbled the IT Swami, closely followed by his swag, which appeared to have been hurled rather than just fell. The police car then drove off while he picked himself up and examined himself for broken bones, or perhaps it was just some exotic late-night yoga - he does subscribe to strange practices. In a familiar routine, I raced downstairs to hide the good whisky and cognac before he got to the doorbell. I slipped the smaller ornaments into a cupboard and put the kettle on. I knew he would need a coffee to sober him up. Every year the IT Skeptic website starts the New Year with our Awards. (You can see last years' awards here). Right now Amazon.com are discounting the book to $27 - that's 20% off! - I have no control over how long they will do this for so don't miss it! 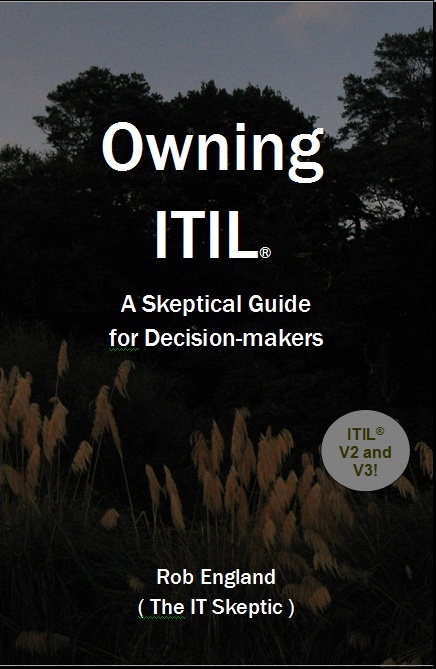 This page is about the book Owning ITIL® written by the IT Skeptic (Rob England). The resource page for owners of the book is here. This book is essential reading for all decision makers (IT-literate or not) who are presented with an ITIL® proposal or who are asked to oversee an ITIL project, or who find something called “ITIL” or “Service Management” in their budget. It tells you what the ITIL industry won’t. For everyone else involved in ITIL projects, this book is just as essential to help you through the ITIL minefield. Every IT department in the world is at least pondering ITIL. As the ITIL projects proliferate, this book is for the executives who must fund them or manage them, and for those who ask those executives for money. The book explains, in lay-manager’s terms, what ITIL is. It reveals what ITIL is good for, what it is bad at, what to expect from it. It describes how to ensure an ITIL project succeeds, what to look for in the business case, and how to measure the results. It does these things in business terms, written by an independent and critical observer. Read the book to get an understanding of ITIL and a context for the recommendations. Or just read the recommendations which have been picked out for your convenience. The busiest managers can use the checklists at the back as ITIL survival tools. 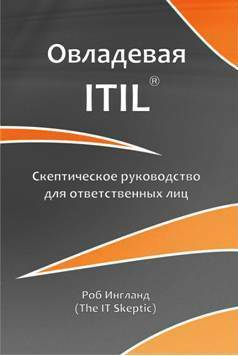 Owning ITIL was translated into Russian by Cleverics and may still be available from them. After reading it (twice), I realized what I had my hands on. This was a book for anyone just starting to research ITIL all the way to those of us who have been forced to drink the kool aid for a long time... I would highly recommend this book for EVERY IT and Management person today. Unbeatable. If you are interested in Service Management (if you are an IT professional, you should be), this book is a must. Enlightening, easy to read, loaded with experience and qualified opinions. The author puts the challenges, the hype, the misunderstandings and the real requirements on the table. You don't have to agree with the author in order to benefit (or enjoy) this book. Helge Skrivervik "Mellvik"
If you are feeling a bit giddy from ITIL training and over-dosing on ITIL PowerPoint slide decks, Owning ITIL provides the perfect antidote that will not only bring your ITIL transformation project down to earth but also greatly increase its likelihood of success. The Pros: Very easy to read and not too long. The references to other literature will help me through the minefield of complimentary guidance/opinions etc. I came across plenty of things I've done (both right & wrong) and potential mistakes that I might be able to avoid moving forward at work. Sometimes I had a wry smile, other times I has an "oh crap, we did that" moment. Just enough humour, while not being condescending or insincere (or maybe I have a thick skin). Some of the book is ageless (not so) common sense and some of the book is very current. Some of the current stuff will become out of date soonish but that's OK. The Cons: if it is read cover to cover, the first half of the book is a bit Michael Moore - Stupid White Men... pleading with the reader to stop reading because all of these ITIL folks are complete shysters. IMHO the book is written from a V2 perspective, which is ok as that is what most people will be trying to address over the next few years, but it does omit how to tackle the business service VS IT service debate (but does discuss that it needs to be had). Make the recommendations stand out more - they are (mostly) bloody outstanding. So it was a few hours well spent reading this book. 4/5 stars. It is the people. IT is the people. Operational readiness of new and improved services ensures a smooth transition from Project to Production. ITIL talks about it in a number of places, but I think Operational Readiness needs to be recognised as a practice in its own right, like any other ITIL "process". 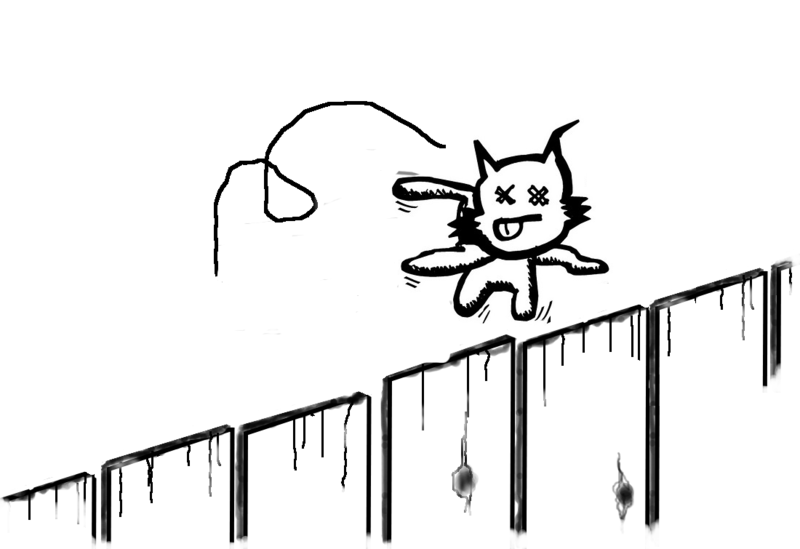 OR is not (just) about being a gatekeeper to Prod: it's about ensuring readiness throughout the lifecycle. OR provides a positive benefit for the customers, projects, development, and operations. [Updated May 2009] The CMDB Federation standards initiative must be the most over-hyped vendor marketing smokescreen ever. Whenever anyone raises the bogeyman of proprietary CMDBs, the vendors wheel this one out as the future promise of interoperability. It is pure vendor double-talk. It solves little and is taking forever to appear anyway. It solves little because the standard defines only how management tools can pass data between them- nothiong about what they pass. I bet the much-trumpeted demos seen so far involved data massaging and informal backroom agreements beyond that dictated by the standard in order to get it all to work. I am highly skeptical (surpise!) about the likelihood that this standard would enable or even faciltiate anything useful in a real-world implementation. 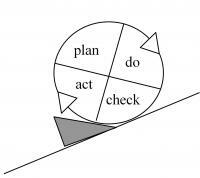 Here is an amusing thing: all those diagrams of the Deming Cycle turn the wrong way. Windows Vista makes the claim of "faster boot times". Faster than what? tectonics? Bill the IT guy was fun in Episode 1. Here is Bill's next excellent adventure from Paglo, having a wee swipe at Apple Corp. Delivery of COBIT User's Guide for Service Managers is slipping waiting on ITIL approval? Delivery date for the COBIT User's Guide for Service Managers has slipped to "first quarter of 2009". (You may recall the IT Skeptic suggested this book will "put a cat amongst the ITIL pigeons"). ITIL V3 Foundations effectively put on hold until May 2009? While the IT Skeptic has been off playing with idle fripperies like Second Life, all sorts of exciting things have been happening quietly behind the scenes in Castle ITIL. It is time we caught up to date with developments. In particular, I wouldn't be doing ITIL V3 Foundation training right now. In a recent announcement from APMG, the IT Skeptic identifies a troubling new terminological debasement trend. Apparently a committee is now a board. We had the Combined Strategy Board, the ITIL Qualifications Board. Now we have the Foundation Review Project Board. Come to think of it, ITIL has been doing this for a while: since when was a CAB anything but a committee? How is ITIL Live doing? I wonder how the ITIL Live website is doing. And where they get their customers from. Having recently become an author I am learning just how bloody hard it is. My humble efforts in no way compare to what the ITIL V3 authors produced. Although they had a lot more help than me, their products were much bigger, more complex, more closely scrutinised and of course much more significant. How confident are you in identifying the difference/s between a stated AIM, a PURPOSE, a GOAL and an OBJECTIVE ? "Objective: the defined purpose or aim of a Process and Activity or an Organisation….."
We traditionally define what constitutes a CI in terms of Change Management but are there better ways? I'm sure I'm not the first to reflect on the evil genius of .docx document format but I feel the need to vent a little spleen. Only the Evil Empire of MickeySoft could be this twisted. The ITSM community should ponder this for two reasons: (1) just how much do we trust Microsoft's 'free' MOF 4.0? (2) ITIL's inability to play nicely with COBIT or other de-facto standards might result in eventual convergence or it might not - watch the scrap between OOXML and ODF for clues. Is the itSMF International website adrift again? I remember seeing an Aussie comedy TV show once (The Games as I recall?) where it suggested that a public statement by the Prime Minister that "So-and-so has our full support" meant they would be out within days. This memory came to me as I wondered why it was necessary for Keith Aldis, CEO itSMF, to come out with a press release to tell the world that “Real progress is being made in the development and implementation of ITIL V3 qualifications". A year and a half after go-live one would bloody hope so. When we want to know how to, say, measure a service desk, we can find quite exact guidance everywhere. But it seems to me the depth and specificity (specifity? specificness?) and usefulness of advice is inversely proportional to the importance of the question. Consider the most important question we need answered in a service management initiative. As we said before, Real ITSM does things differently to, say, ITIL. Readers may recall that Real Priority (also known as Care Factor) is measured by the number of metaphorical fans that are being hit by effluent: it starts at zero and goes up. More conventionally, Real ITSM also tracks a separate User Priority (also known as the Dummy Factor, for the number of dummies being spat).